If you’re considering to or have traveled to Argentina you’ve probably noticed that getting around the country is very expensive by flying. Argentina is a massive country. It’s the third largest country in the Southern hemisphere and stretches 2,268 miles from its northern tip down to its southern tip and up to 889 miles wide. 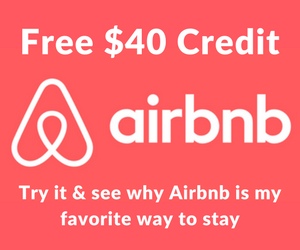 If you’re going to be traveling Argentina for an extended period of time be sure to check out my post on how to exchange and send yourself money at the blue dollar rate. For non-Argentinians, flights are exorbitantly more expensive than it is for locals which makes other options more appealing. There are only a handful of train routes and services can be iffy at best. This is where long distance bus travel journeys come in and if you travel around South America long enough you’re bound to take one. However, when you think of the buses in Argentina, don’t think of Greyhound buses, we’re talking fully flat beds and being served dinner with champagne. What Does Bus Travel in Argentina Look Like? Local bus lines aside, in general there are three bus classes in Argentina: Semi Cama, Cama Executive, and Cama suite. The distinguishing factors that set these classes apart are size and angle of seat recline, serviced meals and drinks, and frequency of inter-route stops. One would like to think that in general prices reflect quality of service, but you can always get a run-down or broken bus on a well-known and recommended company. From my experiences the quality of service can vary dramatically with the same bus company depending on the route. Cama Ejecutivo is definitely a cut above Semi-Cama and it’s likely worth shelling out the extra 100 or so pesos. It’s a common practice for bus companies to have combined Semi-Cama/Cama Ejecutivo buses with 60-70 Semi-Cama seats on the upper level and 10 Cama Ejecutivo on the lower level. You will also find similar set-ups with a mix of Cama Suite seats. Cama Ejecutivo seats are definitely a step up from Semi-Cama. They are significantly wider, recline farther back, and no doubt more comfortable for longer journeys. Cama Suite seats are hands down the best bet for getting a full nights sleep as they recline to a fully flat bed. Semi-Cama seats are in a 2-2 configuration on both sides of the aisle, where both Cama Ejecutivo and Cama Suite seats are for the most part run in a 2-1 configuration (most of the times 2 seats on the left and 1 on the right of the aisle). When you purchase a bus ticket you can choose your seat at the time of booking. 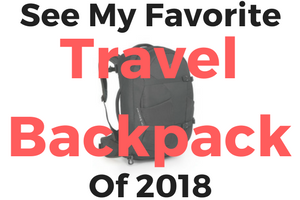 If you’re a solo traveler you can go for the ‘1’ seat or if traveling with a partner you can grab the ‘2’ seats, either way it’s not an issue as there is plenty of room between seats. However, getting up to use the restroom in the middle of the night can be cumbersome if you’re seated on the window side of a ‘2’ seat. Semi-Cama is the cheapest class of bus travel. Expect a comfortable seat which reclines about 120°. Most Semi-Cama buses run in a 2-2 configuration. Promocional Semicama Sin Servicio may also be an option which most likely means the back seats above the engine. You save some money in exchange for the least desirable seats on the bus—engine noise, bumpy, and hot. Cama Ejecutivo seats are significantly wider with more cushioning and recline to around 160°. Most Cama Ejecutivo buses run in a 2-1 configuration. Cama Suite seats are top of the class bus seats in Argentina. They are the same width as Cama Ejecutivo, but they come with a fully-flat recline—think first class airlines. Some buses even have a privacy curtain and individual TV monitors. Service can vary across the board from route-to-route and companies. Depending on the company, route, and time of departure all classes of seats can be con/sin servicio (with/without service). If the bus is “Sin Servicio” you can expect to stop enroute at a cafeteria to buy a meal and be sure to pack along a packable travel water bottle to stay hydrated on longer journeys. Some bus companies have limited or less than desirable water sources. On some Cama Ejecutivo con Servicio and Cama Suite con Servicio buses you will be served wine or champagne, on others you won’t. On most “con servicio” buses you’ll at least get served Coca-Cola, water, and/or coffee. As far as meals, what you get served can be varied across the board. For the most part the food is basic and usually edible—enough to hold you over until you arrive to your destination, but don’t expect to get the bife de chorizo and a glass of Malbec you’d get from your favorite parilla. Don’t even get your hopes up expecting economy class airline food. 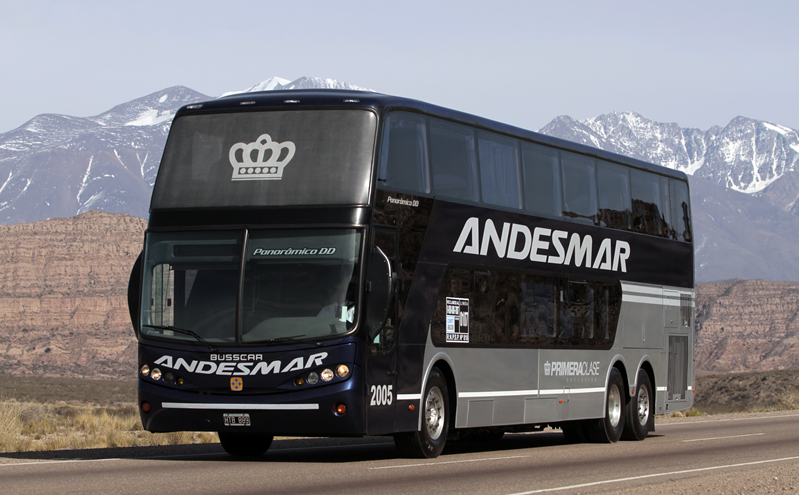 There are several sites that aggregate bus travel options within Argentina. Most are affiliated 3rd party booking sites that allow you to purchase a ticket if you have an Argentine National ID. It may be possible to purchase a ticket online directly from the bus company websites with a passport number. Also note that not all bus companies work with some of these sites. These sites are best used to find which bus companies travel certain routes, departure/arrival timetables, and cost per ticket. 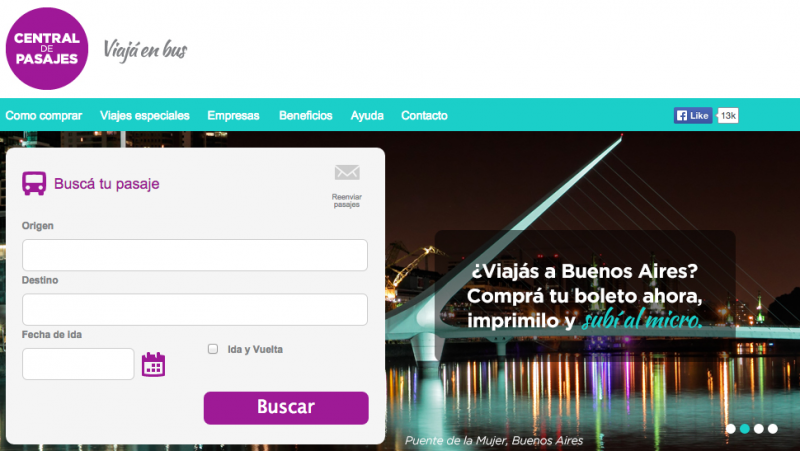 Plataforma10.com – Probably the most wellknown bus ticket booking website in Argentina. They have an easy to use website and have a large range of bus companies bookable through them. There are also ticketing offices in many touristic destinations that can print a paper ticket. Centraldepasajes.com.ar – Another top site for purchasing bus tickets online and finding all bus schedules in one place. It may offer larger selection of bus companies compared to Plataforma10 on particular routes. Omnilineas.com.ar – Another option for searching timetables and purchasing bus tickets. online. Xcolectivo.com.ar – Online bus booking website with most major long-distance bus schedules. companies. Rome2rio.com – A great site to find off-the-beaten-path bus companies and routings, plus it offers a map view map. Retiro.com.ar – Great list of bus companies throughout Argentina. Appears to be affiliated with Centraldepasajes.com. Terminalrosario.gov.ar – Website for the bus terminal in Rosario with lots of information regarding bus travel in and out of Rosario. Note: from experience I’ve found that some information may not be 100% accurate or up-to-date. Note: Some bus companies don’t contract with these 3rd party booking sites and you will have to go directly to their website or go to the bus terminal to see schedules and purchase tickets. There are many variables that can make one company better than the next. I have found that Andemar to be a cut above the rest, but have traveled on most of the buses listed below and can’t say that any of them were bad. Some companies do tend to have newer fleets, but it’s hard to say which companies and which routes tend to have better buses. At most larger terminal de omnibus there are TV screens that display which platforms buses are departing from. Firstly, when you purchase a ticket it will have information showing a range of platforms (plataforma 15 a 20) that the bus may depart from. You’re best bet is to head to the platforms that are listed on your ticket 15-30 minutes early and watch for an incoming bus to have you destination listed on the front. Don’t rely on hearing the loudspeaker announcements and if you have any questions don’t hesitate to present your ticket to any bus driver who will point you in the right direction. Bus terminals are not necessarily unsafe, but as when traveling through any foreign country it’s always a good idea to keep your belongings with you at all times. This is a must when traveling through Retiro in Buenos Aires. You’ll have to worry a lot less about this in smaller cities and towns, but that doesn’t mean you should let your guard down. Be prepared to sleep. Make sure you pack a sleeping mask and ear plugs on overnight buses to ensure you get a good nights rest. The overhead lights may turn on at 4:00 AM at a stop and often the TV’s will be blaring dubbed action films well into the night. Carry small change & bills. When loading and unloading luggage under the bus a porter will assist you, basically just tagging your bag and giving you the corresponding baggage tag. 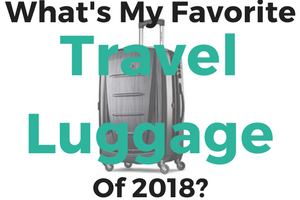 Most of the time they do actually check to see if you have the matching baggage tag when you pick up your bag at the destination. Oh yeah, and they will expect a small tip—a few pesos will do. Choose your seat wisely. Often at time of booking you can choose your seat selection. If you’re booking a Cama seat on the lower level it will be noisier in the rear closer to the engine, but being up front may mean being woken up with people using the restroom in the middle of the night. The first row on the upper level offers superb views if you can handle the often less than safe driving practices. Also, it’s best to try not to get a seat right next to the toilet. Stay hydrated, just not too hydrated. Be sure to pack a bottle of water on longer bus journeys, but also be warned that the restrooms are only a step above a port-a-potty at your local music festival. It also never hurts to pack a bottle of Malbec. Set your alarm. If your stop is enroute to the buses final destination make sure to set an alarm to alert you to get ready to get off. Often on the buses, there are no announcements when stops are made and rarely do the bus employees count passengers until after departing again. This is especially important on overnight buses. 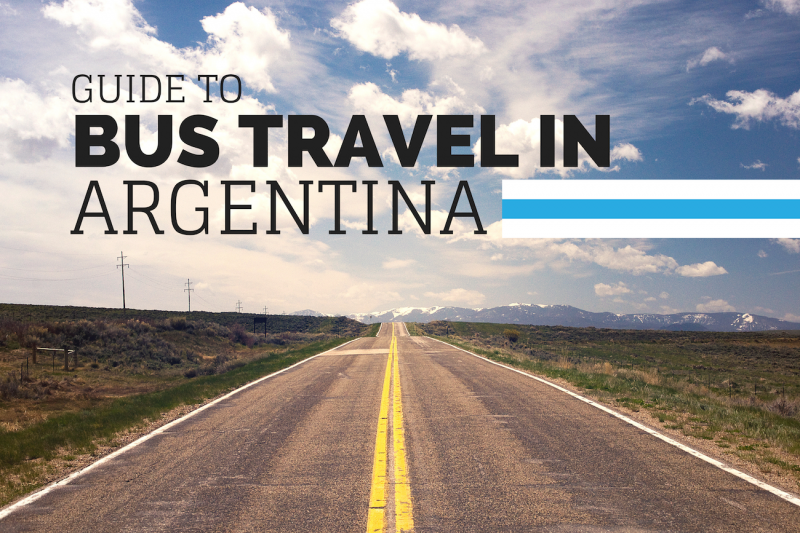 Bus travel in Argentina (and any South American country for that matter) is a excellent choice. The network of both short and long-distance bus routes is impressive and you can get just about anywhere by bus. If you are not pressed for time and want to stretch your travel budget, bus travel is the best way to both save money and see the Argentine countryside. I completely recommend bus travel in Argentina. I’ve taken more than a dozen 10+ hour bus trips throughout the country and wouldn’t hesitate to book a trip by bus to anywhere in the country. Thank you for the article. I read this article before deciding to cross the Andes by buss from Santiago to Mendoza, Argentina. The view and experience was amazing. We choose CATA International, which needs a warning behind their name. We had a horrible experience with them. There was flies and an rotten odor on our bus to Mendoza. On our way back CATA didn’t stop at tour designated Bus Terminal. because the usher and driver forgot that they had two passengers who needed to get off at Los Andes (those passengers where us). We were barely out of Los Andes when we confronted them. And they refused to turn around. Saying we bought tickets for Vina (2 hours away). When we showed them our tickets they said they asked if anyone had a stop in Los Andes (believe me they did not). Not to mention on the manifest list it stated our names and our stop in bold letters. After arguing with them. We were able to get them to drop us at the next town over. But it wasn’t at the town’s bus terminal or any place safe. Rather on the side of the road on a busy highway, know for car jackings and robberies. So two blonde female Americans had to lug our suitcases in dirt, dodged traffic because there was no side walk and avoided getting mugged by a group of guys before we made it to a gas station. I must just warn you: avoid FlechaBus! If you book with them, they may betray you and sell you a ticket which is actually a bad quality local’s bus for most of the way and only a small part of your trip then in an actual Flecha Bus. This happened to me, when I was booking a trip in the FlechaBus office in La Quiaca going to Salta. I had to spend over five hours in a cheap bus (Arco Iris) with neither air conditioning nor bathroom and only the last two hours were actually in a FlechaBus. When I protested before boarding that I had requested a trip in a FlechaBus, the staff at the FlechaBus office told me that I would be changing from the cheap bus into the FlechaBus after 15 minutes. Well, this was a pure lie! Great and helpful article! I’m starting my first slow travel journey at the very tip of Chile/Argentina and making my way up and across the 2 countries so this is very insightful! Glad you found it helpful and have a great trip across Argentina/Chile!